As I said in my last article, once you start shooting video with a DSLR like the Canon 7D, you will start thinking about a camera stabilizer. These systems can be very elaborate and can be intensive on both the operator and the wallet. But, before you think about spending $1000 or more, try the following $10 solution to see if a stabilizer will work for you. A camera stabilizer system really boils down to providing a counter-weight to balance the weight of the camera. If you search on YouTube, you will find several Do-It-Yourself systems. But, the simplest video solution involves using a tripod. By extending the neck of the tripod out, you can find a point where the weight of the tripod will balance the weight of the camera. In the photo above, I have my Canon 7D with a battery grip attached making the weight of the camera fairly heavy. I am also using my Gitzo Traveller Tripod which is fairly light. My $10 solution is to add a 2.5 pound ankle weight (or wrist weight) from Target around the bottom legs of the tripod. As you can see from the above photo, the camera and tripod are actually balancing on the rail. Neat trick! With the camera attached, extend the tripod neck several inches. The legs of the tripod should be closed. Find the balancing point on the tripod neck where the weight of the camera is balanced by the weight of the tripod and the ankle weight. Holding the tripod sideways (horizontally) as shown in the above photo makes it easy. Grab the neck of the tripod firmly with one hand at the balancing point and then use your other hand lightly to steady in the vertical position. Using both hands will distribute the weight and allow you to keep going longer. Keep arms extended with elbows bent. Use the Live View LCD screen to compose your shot. Start walking and try to keep the camera floating at the same level. Use the Live View to make sure the shot is steady. If it seems jittery, stop and start over. It takes practice. Do not use a lens hood. It acts as a sail on the front of the camera and will throw the entire rig off balance with every gust of wind. My first attempt at the beach was a disaster because of the lens hood! This takes a lot of practice. But, it also gives a you a real idea how a “professional” camera stabilizer would feel to operate. I actually used this tripod+ankle weight system in my City Walk video. It does a very good job at eliminating the jittery camera, but the sway from walking is tougher to eliminate, even on the “professional” systems. My next article will be a survey of camera stabilizer systems ranging from $100 to $1000. Photoframed, You have some great tips on this site. I’m new to video and recently got a 7D. On the above mentioned method is the bottom of the tripod with the weight just dangling in a verticle position while shooting? Also, how do see the screen shooting outdoors? I can’t make out much on the screen focusing is next to impossible. The weight is strapped to the bottom of the tripod as shown in the photo, not dangling loosely. As for the LCD screen, you only need to use the screen to monitor your movements. If you see the video is jittery on the LCD while filming, it will look even worse when you view it on your computer’s big screen. As long as the video looks smooth on the LCD, you will be fine (possibly with a slight wobble from walking). I did spend almost two hours before filming the City Walk practicing in Grand Central holding the weighted tripod and walking smoothly. I think I’m getting the hang of it. The tripod is held horizontally. If I’m doing this right one hand has to hold the camera upright, (it wants to flip over). How do you not draw attention walking around like this. In your video nobody seems to notice you. I’m in a small town and people look at me like I’m from another planet. Also can you tell me what lens you were using and the shutter speed? 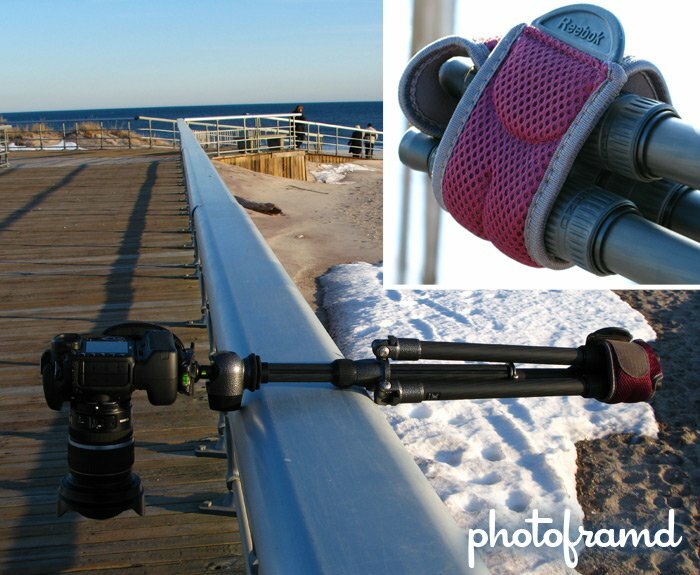 Hold the tripod vertically while filming with your hands at the balancing point. It does take practice. Using an IS lens can help. Be sure to experiment with the IS enabled and disabled to see which works best for you. I found the IS can overcompensate sometimes and add a sharp movement. When I was filming the City Walk, I was more concerned about keeping the camera and weighted tripod “floating” at the same level. I let the 7D set the ISO, the aperture and the shutter speed. Usually the 7D does a great job especially in mixed lighting. My 15-55mm EFS lens was set to 35mm (which is approx. 55mm with the 7D crop) and I filmed in 1080p @ 24fps. What an excellent tip! I would haver never thought of this setup as a quick alternative to buying a stabilizer. Top – Every single movie that I’ve shot with the 7D with IS on has turned out bad because of the jerkiness / movement of the IS. I’d recommend turning it off if you have any type of stabilized environment (tripod, stabilizer, etc). I agree that the IS can create a jerkiness in the video. When I am using a tripod or a stabilizer, it is better to disable the image stabilization to avoid it. Great tip, but I am not quite sure I do it right. Is it possible for you to show it on video how it worls. Thanks, for some great tips on your website. It takes practice! First, it might be easier to use a monopod (instead of a tripod) with the weight on the end like I did in my Halloween 2010 video. The trick is to find the balancing point between the camera and the weighted end. That’s where you place your hand. Now, try walking and filming video. Watch the LCD screen and try to get the image as stable as possible. It also helps to have a lens with image stabilization. With practice, you are create the camera “float”! It depends on the location. There are strict policies at some locations in NYC, but smaller venues may not mind. In this case, the tripod/unipod is not even touching the ground, so they will not know what to make of it. As long as a camera is allowed, they probably will just watch to see if you become an obstacle of others.